Before World War 2 there was little arable farming in Winslow, and the main activity was dairying. During the War, under the direction of the Bucks War Agricultural Executive Committee ("War Ag"), farmers were required to plough up land for arable crops and to reduce the number of livestock, especially sheep, although they were also expected to keep up milk production. The owner of Roddimore Farm was fined in June 1940 for failing to plough a field when ordered to do so. There was a £2 per acre subsidy which the Winslow NFU thought was insufficient (Bucks Herald, 5 Jan 1940). Nationally, the amount of arable land increased 50% between 1939 and 1942. In 1943, it was reported that out of 32,000 acres in the Winslow district, the area ploughed had risen from 1,280 to 10,600 acres, with another 6,100 scheduled (Bucks Herald, 9 July 1943). It was a controversial policy, however, and the Winslow NFU passed a resolution that "the present policy of ploughing up good and old-established pastures in a dairy county such as this is not only likely to result in a serious curtailment of the number of milch cows, but generally in the drastic reduction of the number of milch stock of all ages, as well as beef and mutton" (Bucks Herald, 22 Oct 1943). 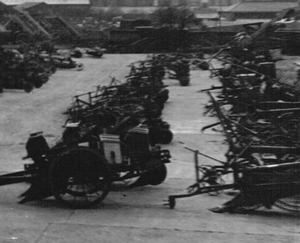 The rows of ploughs and other equipment in the undated photo above may have been surplus to requirements after the War. Colonel Selby-Lowndes of Tinkers Corner was growing oats and potatoes on 2½ acres, and Mrs McCorquodale had sugar beet at Winslow Hall. Smallholders, of whom there were many in Winslow, did not have the equipment for ploughing and harvesting. Eric Hancock, agricultural contractor of Burleys Road and then Verney Road, was in a position to do it for them. He did not do threshing, for which equipment had to be hired from the War Ag at excessive prices according to an NFU meeting in Winslow on 30 Nov 1943 and complaints on many other occasions. There was also a problem with getting the machines, and there was still much unthreshed corn in the Winslow district in April 1944. Some extracts from Mr Hancock's account book are transcribed below. HIRE of LORRY & MAN 16½ ho. 7/6 per hr. 45 hrs LABOUR @ 1/6 per hr. Jesse Rawlings, who lived in the High Street, had a smallholding in Great Horwood Road, where he kept dairy cows. His milk was left by the roadside for collection (the Milk Marketing Board took over the arrangement of collections by lorry in 1942). On 24 May 1945 five airmen from the RAF base at Horwood helped themselves to milk from two 12-gallon churns, were caught by a policeman, and found themselves in the Winslow Magistrates' Court (Bucks Herald, 15 June 1945). 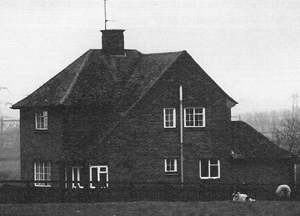 Glebe Farm in Verney Road (photo on right) was a County Council smallholding of 73 acres which Bucks CC bought from Joseph Colgrove in 1930 (Bucks Herald, 28 Feb & 4 July 1930). They built a house there according to their standard design for smallholdings. Herbert Line the farmer died in 1948, aged 58. The stock which was sold afterwards included 40 home-bred dairy cattle, a roan pedigree dairy shorthorn bull, 58 ewes and lambs, 2 strong cart mares and 230 head of poultry (Bucks Herald, 1 Oct 1948). Read the whole of Mr Hancock's account book (PDF file), kindly donated by Sarah Samways. Other customers in Winslow included R. & W. Brudenell (Great Horwood Road), H. Carter (Verney Road), Frank Warner (Nag's Head) and Miss Stock (dairy farm in Verney Road). He also did work in all the adjacent parishes. The labour shortage during the War was met by, among other things, the use of schoolboy labour at harvest time (Winslow had boys from Christ's College and Haberdasher Aske's in 1944), the Women's Land Army, and prisoners of war. Listen to Rhonie Monk's experiences as a Land Girl and Bob Dickins on Italian prisoners at Hanover Farm in the Oral History section. 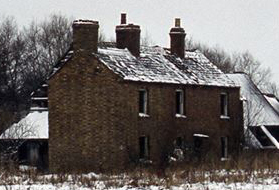 Magpie Farm (shown on the left shortly before demolition; photo from Marc Higgins) was put up for sale in 1943, when it was bought by the tenants. This advert is from the Bucks Herald of 28 May. The centrally situate small Freehold Accommodation DAIRY FARM known as "MAGPIE FARM," situate close to the Railway Station, and having a long frontage to the Railway Coal-yard and the Bletchley-Oxford-Banbury Railway line; also a road front of about two-thirds of a mile to the Little Horwood road, containing A(cres) 75.2.29, with brick and slated Cottage and range of Buildings, as now in the occupation of Messrs. A.J. and W.E. Illing. As a post-war proposition, the site is ideally situated for a Factory or other industrial purpose.